Science Fiction is the fifth and final studio album by American rock band Brand New, released on August 17, 2017  through Procrastinate! Music Traitors. The album is the band's first in eight years since 2009's Daisy. The album's title and track listing were officially revealed on August 17, 2017 after several weeks of speculation, hints and leaks, with its physical release on October 20, 2017. It was both a critical and commercial success, being met with universal acclaim and becoming Brand New's first number one album on the Billboard 200 chart. Following the release of their fourth studio album, Daisy, in 2009, Brand New took time away from writing new music. In July 2014, the band confirmed that they had entered the studio to begin the recording process for the new album. However, they did not officially release any new material until a single entitled "Mene" in 2015, a discarded song from The Devil and God Are Raging Inside Me. Another new song, "Sealed to Me", was also premiered in concert. This was later followed by the release of another single, "I Am a Nightmare", in 2016. Additionally, the band officially released the batch of leaked demos from the Devil and God recording session, as well as an EP consisting of three demos reworked. During that time period, Brand New hinted several times through concerts and merchandise that the band would be breaking up in 2018. The band initially prepared to release their fifth album in 2016; however, they postponed the release in September 2016 after expressing dissatisfaction with the final product. On August 15, 2017, Brand New updated the website for their record label, Procrastinate! Music Traitors, allowing for pre-orders of a confirmed fifth album to be shipped in October on vinyl format in a limited quantity. A tour of the Eastern United States and the UK was announced as well. On August 17, a CD containing one 61-minute long track was shipped to people who had pre-ordered the limited edition vinyl, with each CD numbered out of 500. The track, entitled "44.5902N104.7146W" (coordinates to the Devils Tower National Monument in Wyoming, also known as the setting for the 1977 sci-fi film Close Encounters of the Third Kind) came with a booklet including quotes from the Poole versus HAL 9000 chess match scene in the 1968 sci-fi film 2001: A Space Odyssey. The track was livestreamed by a fan through a Facebook group, where the album title Science Fiction, artwork, and certain track titles such as "No Control", "Desert", "Out of Mana", "In the Water" and "451", were revealed using the music identification app Shazam. Later that day, the band made the album available for pre-order in vinyl, CD and digital download formats for release in October. The physical edition of the album was released on October 20, 2017. Vinyl pre-orders, including white and blue and red variants, were delayed due to pressing issues with the record label Procrastinate! Music Traitors. The cover is based around a photograph by Swedish artist Thobias Fäldt. The photograph features two women, Malin and Emma, seemingly jumping from a window. The packaging for the release has been created by Brooklyn based studio Morning Breath, Inc., who also worked on the artwork for Daisy and "Mene". Science Fiction received widespread critical acclaim. At Metacritic, which assigns a normalized rating out of 100 to reviews from mainstream critics, the album received an average score of 88, indicating "universal acclaim." Awarding the album a "Best New Music" designation, Pitchfork's Ian Cohen praised Science Fiction as "a wise and vulnerable conclusion for a rock band who were crucial in shaping a scene, a sound, and many emotions." "Same Logic/Teeth" was awarded "Best New Track". Zoe Camp of Spin called it a "nostalgia-steeped, emotionally draining record" which makes for "a worthy (if bittersweet) send-off to one of the most brutally honest, forward-thinking rock bands of the new millennium." Michelle Geslani of Consequence of Sound noted familiar themes of "morality, truth and authenticity, religion as an institution, and mental health issues", while concluding that "on Science Fiction Lacey sounds more resigned to his fate than ever before." Chris Payne of Billboard felt that the album establishes Brand New as "part of a lineage of constantly-shape-shifting, steadfastly fascinating experimental rock bands." In Uproxx, Steven Hyden labeled Science Fiction as the "emo Abbey Road", while Emma Garland of Vice called it "a fitting ending" to the band's career. Sputnikmusic stated that Science Fiction "obliterates already unreasonably high expectations while forming one of the best and most anticipated curtain-calls in recent memory." Science Fiction debuted at number one on the US Billboard 200 in the issue dated September 9, 2017, with 58,000 album-equivalent units. Of that tally, the album sold 55,000 traditional album copies. Science Fiction marked the first number one album of Brand New's career, topping their previous high of Daisy's number six debut in 2009. Additionally, it became the first independently released album to top the charts since Frank Ocean's Blonde did so in 2016. The fourteen-year gap between Brand New's first charting album, Deja Entendu in 2003, and their first number one album in 2017, is the longest since David Bowie's 43-year gap from 1973 to 2016. Science Fiction also debuted at number one on Billboard's Independent Albums chart. In its second week, Science Fiction fell to No. 97, setting a new record for the steepest fall from number one in the history of the Billboard 200 chart. By the next week, the album fell off the chart completely; with two weeks, Science Fiction was the shortest lasting number one album in Billboard history. However, the album re-entered at No. 50 in October after its physical release. The track "Can't Get It Out" was promoted to alternative radio stations and listed as the "Artist's Pick" on Spotify. All music written by Brand New. Note: The initial track listing was one long track entitled "44.5902N104.7146W", which are the approximate coordinates for Devils Tower. ^ a b "Brand New release first album in eight years, Science Fiction". Consequence Of Sound. Retrieved August 17, 2017. ^ a b Sherman, Maria. "Brand New, Again: 'Science Fiction' Is A Self-Revival". npr. Retrieved August 26, 2017. ^ "Brand New Surprise-Releases New Album Science Fiction". Paste Magazine. Retrieved August 17, 2017. ^ a b "Brand New Release New Album Science Fiction | Pitchfork". pitchfork.com. Retrieved August 17, 2017. 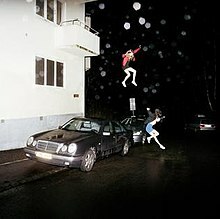 ^ "Brand New Have Released Their New Album Science Fiction". Spin. August 17, 2017. Retrieved August 17, 2017. ^ a b Desk, BWW News. "Brand New's 'Science Fiction' Available Now on Vinyl & CD". Retrieved October 20, 2017. ^ "Brand New Confirm New Recording Sessions Have Begun". Music Feeds. July 5, 2014. Retrieved August 17, 2017. ^ "Brand New premieres "Mene", first new song in six years — listen". Consequence of Sound. April 13, 2015. Retrieved August 17, 2017. ^ "Watch Brand New Debut Second New Track, 'Sealed to Me'". Spin. April 16, 2015. Retrieved August 17, 2017. ^ "Hear Brand New's Brooding New Track 'I Am a Nightmare'". Rolling Stone. Retrieved August 17, 2017. ^ "Brand New officially release leaked 2006 demos - News - Alternative Press". Alternative Press. Retrieved August 17, 2017. ^ "Brand New Release New EP 3 Demos, Reworked | Pitchfork". pitchfork.com. Retrieved August 17, 2017. ^ "Jesse Lacey confirms Brand New's breakup: "We're done"". Consequence of Sound. July 1, 2016. Retrieved August 17, 2017. ^ "Brand New Postpone New Album, Take 'The Devil and God Are Raging Inside Me' on Tour". Retrieved August 17, 2017. ^ "Brand New Announce 'Very Limited' Fifth Album Vinyl Pre-Sale". Billboard. Retrieved August 17, 2017. ^ "Brand New announce new (and possibly final) album, plus fall tour dates". Consequence of Sound. August 15, 2017. Retrieved August 17, 2017. ^ "Brand New fans have started to receive a mysterious one-track, 61-minute long CD". NME. August 17, 2017. Retrieved August 17, 2017. ^ "Brand New Detail 'Science Fiction' Album". Retrieved August 17, 2017. ^ "Title, artwork, track titles for Brand New's upcoming album revealed via secret fan packages". Consequence of Sound. August 17, 2017. Retrieved August 17, 2017. ^ "Brand New's 'Science Fiction' vinyl hit by delay | Upset". www.upsetmagazine.com. Retrieved October 26, 2017. ^ "Vice Fashion - Smarty Party". Vice. April 2, 2008. Retrieved August 18, 2017. ^ "Brand New Science Fiction". Procrastinate! Music Traitors. August 17, 2017. Retrieved August 18, 2017. ^ Monger, Timothy. "Science Fiction – Brand New". AllMusic. Retrieved October 14, 2017. ^ Anthony, David (August 23, 2017). "Brand New Writes Its Own Eulogy With 'Science Fiction'". The A.V. Club. Retrieved August 24, 2017. ^ a b "Reviews and Tracks for Science Fiction by Brand New". Metacritic. Retrieved August 23, 2017. ^ Johnson, Emma (October 4, 2017). "Brand New - Science Fiction album review". Classic Rock. Retrieved December 9, 2017. ^ a b Geslani, Michelle (August 22, 2017). "Album Review: Brand New – Science Fiction". Consequence of Sound. Retrieved August 22, 2017. ^ Sharpe, Christopher T. (August 29, 2017). "Album Review: Brand New – Science Fiction". Drowned in Sound. Retrieved October 14, 2017. ^ Gormely, Ian (August 21, 2017). "Brand New: Science Fiction". Exclaim!. Retrieved October 14, 2017. ^ a b Cohen, Ian (August 23, 2017). "Brand New: Science Fiction". Pitchfork. Retrieved August 23, 2017. ^ Garner, George (November 2017). "Brand New: Science Fiction". Q (378): 104. ^ Turner-Heffer, Adam (August 23, 2017). "Brand New – Science Fiction". The Skinny. Retrieved October 14, 2017. ^ Dixon, Hollister (September 24, 2017). "Brand New: Science Fiction". Spectrum Culture. Retrieved October 14, 2017. ^ a b "Review: Brand New - Science Fiction | Sputnikmusic". www.sputnikmusic.com. Retrieved August 23, 2017. ^ ""Same Logic/Teeth" by Brand New Review | Pitchfork". pitchfork.com. Retrieved October 27, 2017. ^ Camp, Zoe (August 25, 2017). "Review: Brand New Bid Us Farewell on the Great Science Fiction". Spin. Retrieved August 25, 2017. ^ Payne, Chris (August 18, 2017). "Brand New's 'Science Fiction' Is a Dizzying, Legend-Making (and Potentially Career-Closing) Album". Billboard. Retrieved August 18, 2017. ^ Hyden, Steven (August 23, 2017). "Brand New's Great Swan Song 'Science Fiction' Is The Emo 'Abbey Road'". Uproxx. Retrieved August 23, 2017. ^ Garland, Emma (August 22, 2017). "Brand New's 'Science Fiction' and the Terminal Dread of Being Alive". Vice. Retrieved August 22, 2017. ^ Caulfield, Keith (August 27, 2017). "Brand New Scores First No. 1 Album on Billboard 200 Chart With 'Science Fiction'". Billboard. Retrieved August 27, 2017. ^ McIntyre, Hugh. "Last Week's No. 1 Album Has Experienced The Biggest Drop From The Top Spot Of All Time". Forbes. Retrieved September 17, 2017. ^ "ARIA Australian Top 50 Albums". Australian Recording Industry Association. August 28, 2017. Retrieved August 26, 2017. ^ "Brand New Chart History (Canadian Albums)". Billboard. Retrieved August 29, 2017. ^ "NZ Heatseekers Albums Chart". Recorded Music NZ. August 28, 2017. Retrieved August 25, 2017. ^ "Official Scottish Albums Chart Top 100". Official Charts Company. Retrieved October 28, 2017. ^ "Official Albums Chart Top 100". Official Charts Company. Retrieved August 26, 2017. ^ "Brand New Chart History (Billboard 200)". Billboard. Retrieved August 29, 2017. ^ "Brand New Chart History (Independent Albums)". Billboard. Retrieved August 29, 2017. ^ "Brand New Chart History (Top Alternative Albums)". Billboard. Retrieved August 29, 2017. ^ "Brand New Chart History (Top Rock Albums)". Billboard. Retrieved August 29, 2017. ^ "Science Fiction by Brand New". iTunes Store. Apple Inc. Retrieved September 2, 2017. ^ "Science Fiction". Amazon.com. Retrieved September 2, 2017. "Jude Law and a Semester Abroad"
"The Quiet Things That No One Ever Knows"
"Sic Transit Gloria... Glory Fades"
This page was last edited on 13 November 2018, at 23:55 (UTC).